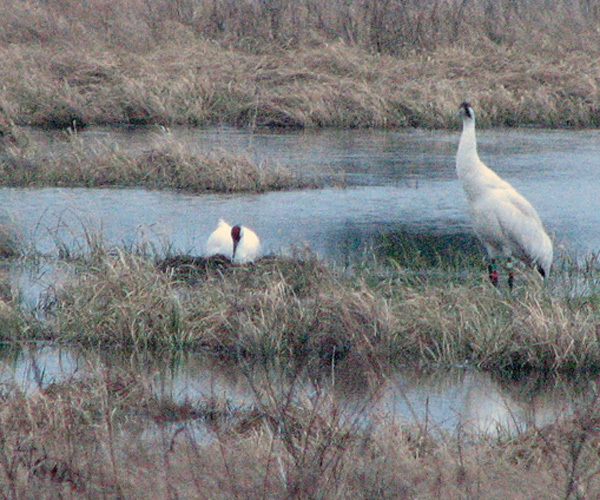 Meet the New 2006 Whooping Crane Chicks! Meet the first family in this slide show! Fall 2006: W1-06 (also may be noted on Journey North as W601) is a very special chick! She was the new flock's very first wild-hatched chick to survive. 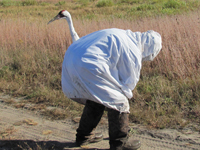 She is now the first second-generation Whooping crane to successfully make the migration south. That's really something to celebrate! W1-06 left Wisconsin on her first migration on November 19 with her parents. The family arrived at the Florida wintering grounds Dec. 9. Their first stop was where the parents first migrated when they were chicks: the winter pen at Chassahowitzka National Wildlife Refuge ("Chass"). To the surprise and concern of experts, they stayed a while in a neighborhood in Hernando County, Florida. They were seen in backyards only a few meters from houses, eating under bird feeders and in flower beds. This is not a good choice of habitat, so experts are keeping an eye on the family. Trackers confirmed that the first family survived the Florida storms of Feb. 1-2 that killed 17 of the 2006 ultralight flock. 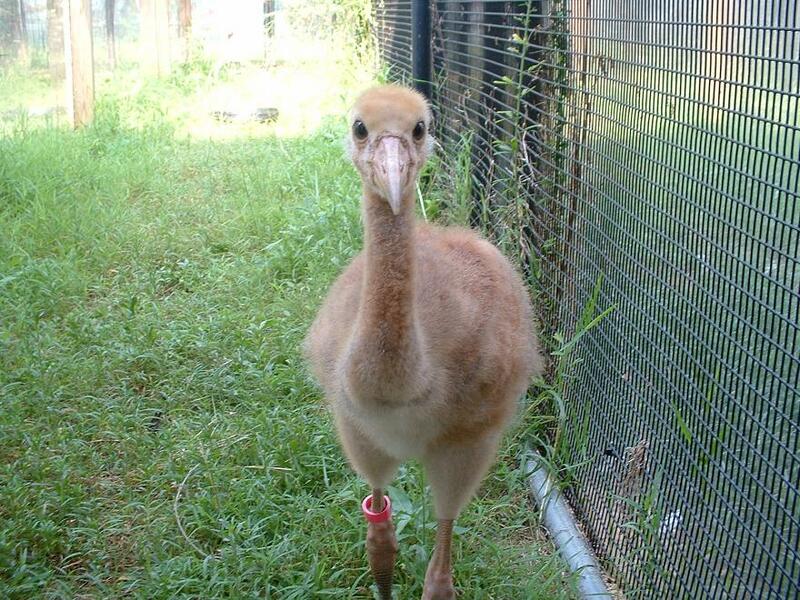 Wild 1-06 is the only other remaining wild whooping crane hatched in 2006 to the new Eastern Flock. Spring 2007: The First Family (Mom 217, Dad 211, and female chick W1-06) began the young crane's first northward migration from Florida on Feb. 23. No further reports were received until March 20 — when the First Family arrived back at the Necedah National Wildlife Refuge! 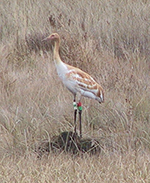 Whooping Crane #W1-06 is the first wild-hatched chick in the eastern migratory population and the first to complete a roundtrip migration by following her parents. An aerial survey on March 23 showed that W1-06 had now separated from her parents, and she was seen roosting alone that night on the refuge, near but not on her parents' territory. Hooray! This is normal behavior for a chick her age. 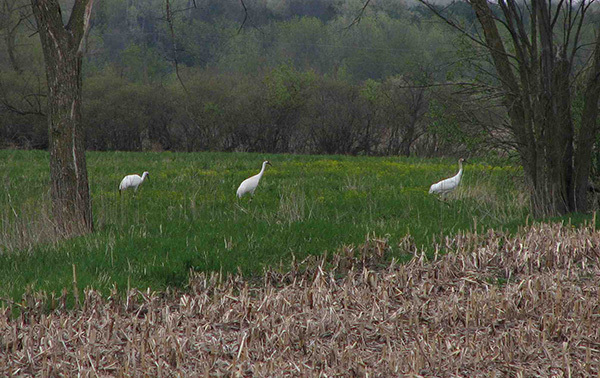 In her first independent days, she spent time with other whoopers. Here she is with #510 and #511. Male #307 trying to dance with W1-06. But soon she had another boyfriend: #310. Spring 2008: She began her second journey north on March 9 and was tracked to Thomas County, Georgia. Confirmed back at Necedah on March 30! In early April, Sara Zimorski said, "We were excited to see W1-06 and 307 hanging out together and hope they may become a pair." But in April, W1-06 joined up with #310. Eva said, "They actually built a nest and she was observed sitting on it!! They were not on it the next day, and there were no eggs (W1-06 is too young), but it's exciting news anyway!" April 9: First nest of wild-born female W1-06! No eggs, but good practice! Male #310 is with her. Tracker Anna Fasoli said, "W1-06 has apparently found a new love with #310, possibly filling the void that his stolen mate left? They even built a nest together, and sat on it for a day (no egg: W601 is too young). The new pair is still together. They defend their new territory from any crane that enters it. 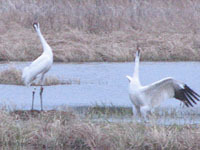 They frequent a few corn fields off the refuge, but always return to the refuge. Male #307 is usually not far away, lurking in the shadows of their territory, possibly plotting to steal her back. Regardless, W1-06 seems to have MANY different options for mates, although it looks as though she has found "the one" in #310, as building a nest together signifies a strong bond." August 2008: Wild female #W1-06 and ultralight-led male #310 are a pair. By August, she was still with male #310. They liked to hang around the grassy training stip where the Class of 2008 chicks were learning to fly with the ultralight. 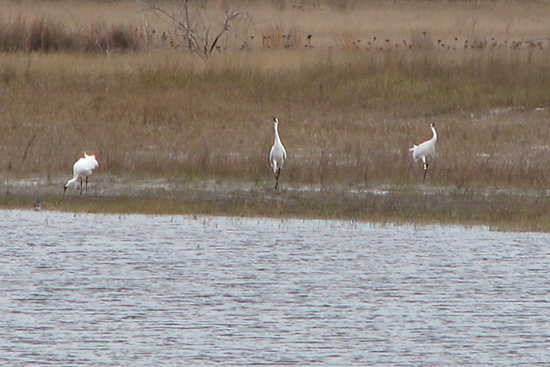 Fall 2008: Began migration from Wisconsin on November 17, along with mate #310 and 12 other Whooping cranes. They were detected in flight while migrating over Perry County, Indiana, on December 7. The pair arrived on #310's previous wintering area in Colleton County, South Carolina, on December 17.
year #307 and W1-06 were hanging out together before #310 came along so we'll see what happens." In April #310 and W1-06 built a nest but it was unsuccesssful. She and her mate stayed in the core area all summer. 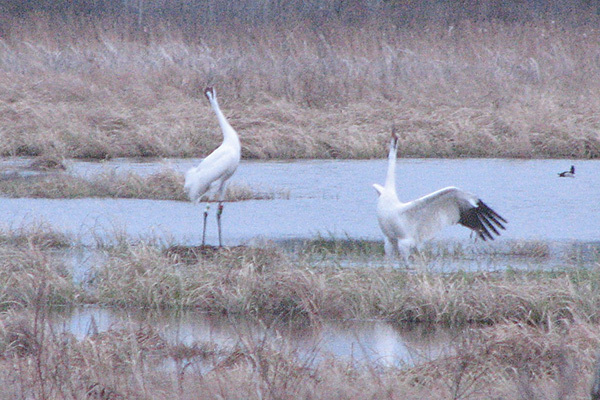 Fall 2009: Female W1-06 and her mate #310 began migration November 26 along with several other whoopers. These two were located at a previously used stopover on a reclaimed surface mine in Indiana, on November 28 for an extended stay. They were confirmed on their wintering territory in Colleton County, on January 5. Spring 2010: Pair W1-06 and #310 were no longer detected on their wintering area after March 1. Male 310 was reported back on Necedah NWR on March 22, and W1-06 (later confirmed on March 28) presumably arrived with him. They were observed on a nest during an aerial survey on April 5, but the nest was unproductive. Marianne gets ready to release W1-06 after her rebanding in fall 2010. W1-06 walks away with a new band—and lots of mud on her feathers! 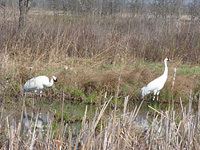 Fall 2010: Female W1-06 and male #310 began migration on November 20. They were found east of Terre Haute, Indiana on November 24 and stayed there at least through December 11. They were next reported on their usual wintering territory in Colleton County, South Carolina, on January 5. Spring 2011: Last detected in Colleton County SC on Feb. 19, migrating pair #310 and W1-06 was in Parke County, IN at least through March 16. 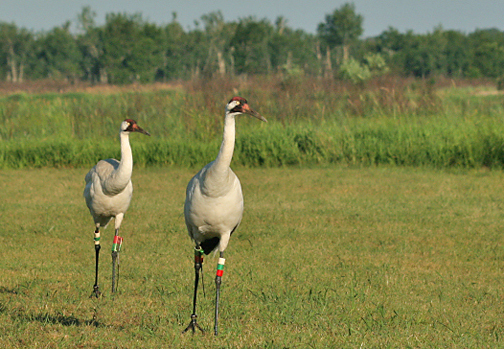 They completed migration to their territory on Necedah NWR, by March 25. By April 8 the pair was incubating on a nest, and on May 9 came the thrilling news of a chick! 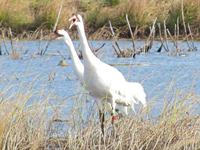 Female W1-06 was the first wild migratory Whooping crane chick to be hatched in the U.S. in more than a century, and she has now produced offspring five years later! That's something to celebrate! Sadly, the chick went missing after a few days and may have been taken by a predator. The pair did not attempt a second nest this summer. Fall 2011: #W1-06 and 310 wintered in Clay and Vigo Counties, Indiana. Spring 2012: ICF tracker Eva heard the signal of W1-06 in flight over ICF in Baraboo, Wisconsin on March 15, but she did not hear the signal of #310. She was concerned, especially when W1-06 was seen on Necedah NWR in active flight with another female. But her mate showed up on March 16, and it was a mystery where he had been. The pair had a nest together as of April 14! On the April 26 survey flight, they were off the nest and it appeared from photos that the nest was empty and had failed. They did not re-nest, so there were no chicks for this pair in summer 2012. Fall 2012: ICF tracker Eva detected #W601 and Crane #310 (10-03) at a migration stopover location in Vigo Co, Indiana on November 1. Spring 2013: W1-06 and mate #10-03 completed spring migration March 30. By late April or early May they were reported nesting but the nest soon failed and they did not attempt another nest this summer. 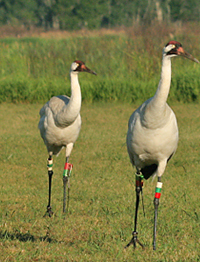 Fall 2013: ICF tracker Eva reported that two cranes, very likely #W1-06 and #10-03, were reported in Clay County, Indiana on November 16. They continued migration next from Vigo County, Indiana to Meigs County, Tennessee by January 1 and arrived at a previous wintering location in Colleton County, South Carolina soon after. 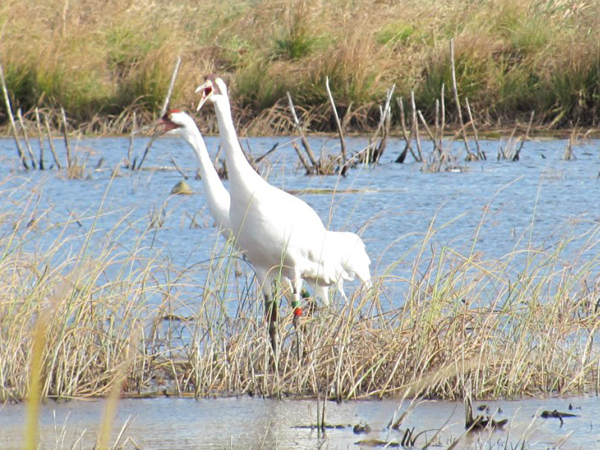 Spring 2014: Pair W1-06 and #10-03 were seen on their wintering territory in Colleton County, South Carolina, on 21 February and had migrated back to Necedah NWR by March 31. However, everything changed after the return. Female W1-06 paired with a new mate, #1-10 , while her former mate (#10-03) paired with #34-09 (1-10's former mate). 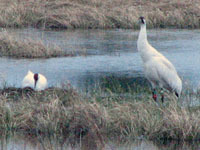 The new pair nested, and the nest was stilll active when checked on April 30. They hatched a chick but the status was uncertain as of the May 29 aerial survey fligh, as neither parents nor chick could be found. Neither adult has a working radio transmitter. 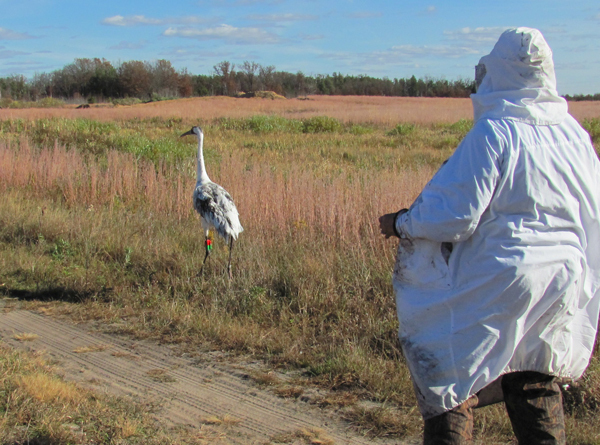 Fall 2014: Crane W1-06 migrated south to Hopkins County, Kentucky, where she was associating with #1-10 and several other Whooping Cranes at the end of December. Those cranes were all still there in February, 2015. 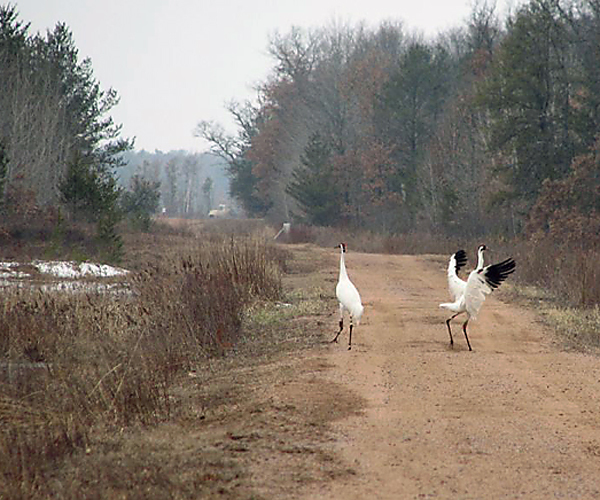 Spring 2015: Crane W1-06 and mate #1-10 were seen back on Wisconsin territory during the March 25 aerial survey by Bev Paulan, DNR pilot. The pair nested, but the nest failed April 30, and they did not re-nest. 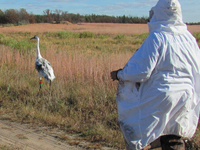 Spring 2016: Crane W1-06 and mate #1-10 migrated back to their Wisconsin territory and were seen on a nest during the May 19 and June 3 aerial surveys by Bev Paulan, DNR pilot. Their new chicks, W16-16 and W17-16, were first seen on June 2 and June 5 respectively, but neither chick survived into the summer. Fall 2016: Pair #W1-06 and male #1-10 were still in Juneau County, WI as of Nov. 25 but by early December had migrated to Greene County, Indiana for the winter. Spring 2017: Pair #W1-06 and male #1-10 were back inWisconsin and nesting by early April. The pair re-nested and were incubating their second nest when seen on Bev Paulan's May 12 flight. On June 2 they hatched chick W11-17, who survived until about mid July. 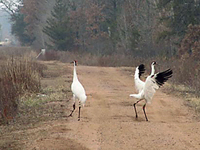 Back to "Meet the Flock 2006"
Journey North is pleased to feature this educational adventure made possible by the Whooping Crane Eastern Partnership (WCEP).